The company which bought the former Crafar farms has won an award for turning the business around using New Zealand management, labour and skills. Milk New Zealand, owned by Shanghai Pengxin, was last night named supreme winner at the 2015 HSBC New Zealand China Trade Association Business Awards in Auckland. Shanghai Pengxin bought Crafar Farms in 2012 for more than $200 million. Gary Romano, chief executive of Pengxin International, said the award was recognition for how they had run the farms. Shanghai Pengxin’s purchase of the farms was controversial – but Mr Romano believed it had been good for New Zealand. “Look, as a New Zealander, I did think to myself, am I doing something that’s good for New Zealand as well as my company? “After speaking to a number of economists and thinking clearly through this I’ve come to the view that there is absolutely no downside to foreign investment. “I think some of the things that the Overseas Investment Office does are very correct. He said once those tests had been passed, such investment provided oxygen for the economy. . . The combination of foreign investment and local skills has been a winning one which shows the benefits that can result from allowing overseas ownership of some land. He began by referring to his intention to strengthen resources at the border and to establish Government Industry Agreements (GIA) with various sectors which will ultimately involve the private sector in sharing the costs of biosecurity; different sectors are at various stages of negotiation on this issue. . . .
Warren Ayers farms 890ha of rolling country near Wyndham. The property runs 600 Perendale stud ewes and another 5,700 commercial ewes. Lambing averages 135 per cent and lambs are finished to 17kg. Two-year-old replacement heifers are bought in annually for the 120-head Angus cow herd. Every year, all but the lightest 10 calves are sold at weaning. The policy is simple to manage and keeps the genetics of the herd diversified sufficiently that the same bull can be used for several years. For the past five years, the property has also wintered 650 dairy cows. Warren has EID tagged his stud animals since 2006 and the commercial two-tooths have been tagged since 2009. . .
Director General of Agro Industry at the Ministry of Industry, Panggah Susanto, joined Fonterra at an event in Jakarta to mark the official start of construction today. Pascal De Petrini, Managing Director of Fonterra Asia Pacific, Middle East & Africa (APMEA), said that Fonterra Brands Manufacturing Indonesia Cikarang Plant will allow Fonterra to meet the ever-growing demand for dairy nutrition in Indonesia. . .
Primary Industries Minister Nathan Guy says dry conditions in parts of Waikato and Northland remain a serious concern. “Local authorities in Northland have announced the western parts of their region are in drought. This reflects the tough few months they’ve had as pasture has browned off. “Cyclone Lusi has helped green tinges appear in some places, but the rainfall was erratic and insufficient. Western Northland and large parts of the Waikato remain very dry. “The Ministry for Primary Industries is keeping a close eye on conditions here and elsewhere. I’ve seen for myself how dry things are on two trips to the Waikato in the last two weeks. . . The adverse event declaration covering drought in Northland’s West Coast the declaration will not provide a lot of direct financial assistance but will provide huge psychological relief. “New Zealanders will get an inkling of what the guys on Northland’s West Coast have been going through. Not just since November, but since 2012 and even before that,” says Roger Ludbrook, Federated Farmers Northland provincial president. “The big thing a declaration triggers is the Northland Rural Support Trust, so any farmer can approach the RST for free advice on farm management, or just someone to have a decent chinwag with. “Beyond this, it doesn’t mean much financially unless the absolute worst happens. There is a safety net, but it is exactly the same as for any other New Zealander and carries the same eligibility rules. “Then there is Inland Revenue and to be fair to them they aren’t unapproachable. . .
Drought-affected farmers should talk to their banks said the New Zealand Bankers’ Association in response to increasingly dry conditions in parts of Northland and Waikato. “We encourage any farmers facing hardship as a result of the lack of rain to contact their bank to discuss options for assistance and how they can work through these challenging conditions,” said New Zealand Bankers’ Association chief executive Kirk Hope. . . .
“I think the fall in operating profit will grab attention instead of where it ought to be focussed, on revenue,” says Willy Leferink, Federated Farmers Dairy chairperson. “This is real money coming into the New Zealand economy. I mean revenue for the half-year is up 21 percent to $11.3 billion. While we’ve got close to the $20 billion barrier in the past, this time, we’ve got a real chance of breaking it. “That said, the declared drought in Northland along with drought-like conditions in the upper North Island could act like a brake. We’ve also seen GlobalDairyTrade retreat in recent trading events due in part to increased volume. . .
(BusinessDesk) – Shanghai Pengxin has hired Gary Romano, who resigned from Fonterra Cooperative Group last year during the botulism scare, to oversee the Chinese company’s overseas operations including its New Zealand farms, the NZ Herald reports. Romano’s Linked In profile says he is “currently on the beach before becoming active again in 2014.” He resigned as head of NZ Milk Products at Fonterra last August as the company embarked on a global recall of whey protein concentrate. The bacterium was eventually shown to be harmless. He will become chief executive of NZ Milk Management and a director of Pengxin’s two farm groups in the North Island and South Island, according to the Herald. Terry Lee, managing director of Pengxin’s Milk New Zealand unit, didn’t immediately return calls. . .
Sheep farming in Samoa is growing through a programme funded by the World Bank. Under the Samoa Agriculture Competitiveness Enhancement Project, the World Bank is helping develop livestock, fruits and vegetable farming. Sheep were introduced in Samoa in 2004, with the flock now grown to 700. . . This milestone is acknowledged by AngusPure’s chairman Tim Brittain, who says the ‘McAngus’ programme has been instrumental in helping grow the demand for Angus cattle, and that Kiwi farmers have been well rewarded since the original launch of the Angus burger range in 2009. . .
KPMG has delved into the perplexing reasons why young people don’t take careers in agriculture more seriously in a country which relies upon the primary sector. Hugh Stringleman has read its latest Agribusiness Agenda report. The capability of the people who work the land has made New Zealand what it is today. While competitors can replicate equipment and processes, it is not easy to replicate the insight and relationships that people have developed over decades, according to the latest KPMG agribusiness report. But the ages of existing farmers, orchardists and scientists continue to rise and the entire primary sector faces manpower shortages now and in the future. . .
At this time of year companies are doing their best to minimise any losses in the last quarter. There is no doubt the final results will be a lot better than last year, but they have to be, because the large companies could not sustain another big hit to their balance sheets. Combined current and non-current debt between Silver Fern Farms, Alliance and ANZCO of $710 million at 30 September 2012 to fund losses and inventories means a substantial improvement this season is absolutely essential. The noises from the processors suggest moderate profits at best, mainly because of a sell down of inventory leading to reduced current debt and better control of procurement, offset by lower margins. . .
Fonterra boss Theo Spierings has consolidated his powerbase at the dairy co-operative with chairman John Wilson’s emailed statement to shareholders that the board has confidence in the way the chief executive is handling the tainted whey protein affair. The brutal truth is that long-time senior executive Gary Romano – who ran the New Zealand operation – had already offered himself up as the sacrificial lamb. Romano’s resignation came before the various inquiry teams had even started delving into who to blame for the late discovery of “clostridium” in a batch of whey protein which had been made into infant formula and other products. Since then two other executives have been put on leave – a clear indication that Fonterra already has a good idea where the buck will stop on this fiasco. . . Following a successful inaugural event, the Heartland Bank Young Auctioneers Competition will return to the Canterbury A&P Show in 2013. The competition aims to showcase and develop young livestock auctioneers and improve the standard of auctioneering across the board. During the judging, which includes a test of auction rules and a mock auction, each entrant will be required to sell three lots of heifers/bulls. . . Entering the Ballance Farm Environment Awards helped a fledgling Southland dairy operation measure its progress as a successful and sustainable farming business. South Coast Dairy Ltd, an equity partnership between five families, owns 202ha between Curio Bay and the Haldane Estuary in Eastern Southland. The former sheep and beef farm was converted four years ago and now milks 385 cows on a 135ha milking platform. Mindful of the farm’s location in a sensitive coastal area, the owners have made a big effort to mitigate the environmental impacts of dairying, with extensive riparian fencing and planting work conducted following consultation with the Department of Conservation, Environment Southland, Landcare Trust and Fish and Game. . .
As the pioneers of the Marlborough wine region and its signature varietals, Sauvignon Blanc and Pinot Noir, Brancott Estate is excited to celebrate 40 years since the first planting of vines at Brancott Vineyard, home of world-renowned Brancott Estate wines. 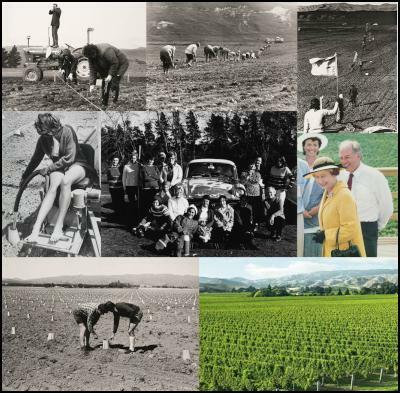 On 24 August 1973, in front of a crowd of local media, politicians and business leaders, the Marlborough wine industry was born. At the time, the founder of what is now Brancott Estate, Frank Yukich made the statement that “wines from here will become world-famous” – and indeed they have, receiving many prestigious awards and accolades around the world. . .
Average lamb prices look as though they will be down 25 per cent nationally at $84 to $85 a lamb for the 2012-13 season ending next month. Softer overseas markets in the northern hemisphere and smaller lamb weights from the drought drove prices down from $113.60 the previous season. While it’s early days yet the Economic Service at Beef + Lamb New Zealand expects prices will be somewhere between $90 to $100 for the coming 2013-14 season. That will depend heavily on the state of the dollar with the latest analysis for it to weaken slightly. . .
FONTERRA’S year-long trial of rough terrain vehicles to replace quad bikes on its farms looks promising as it draws to a close. Two vehicles are being tested at the 225ha Whareroa Research Farm near Hawera, where 640 cows are being milked this year. The company is testing five RTVs on drystock farms in the South Island and four on dairy farms. The trial, which began before the Government Taskforce on Health and Safety completed its report in April this year, will conclude in December. By then, it will have covered the entire farm season. . . Opponents of the planned 8.2 million cubic metre storage dam for the Waimakariri irrigation scheme have vowed to fight the proposal, saying it will put lives at risk if breached in a earthquake. About 70 people attended a meeting in West Eyreton Hall last week to hear from the Eyre Community Environmental Safety Society (ECESS), the group set up to oppose the dam. “ECESS believes WIL’s [Waimakariri Irrigation Ltd] solution of a 13-metre-high one kilometre square dam in a seismically active climate is wilfully placing lives at risk to keep shareholder company costs down,” said society chairperson Catherine Ballinger. . .
New Zealand can climb its way back up the international wealth tables, argue two scientists in a book* launched last night. But we won’t do it if we continue to rely so heavily on agriculture. Prosperity describes a state of flourishing or thriving. In New Zealand there is a sense that we have flourished less than we might, and especially less than many other countries we like to compare ourselves with. Through insufficient resources, our health system is unable to provide the treatments that are available for free in countries such as Australia or Canada. Our infrastructure is decrepit, our roads are poor, our passenger train systems are an embarrassment to us, and many of our houses are inadequate or, even when new, badly built. Our native forests are in decline because we cannot afford to address pest control in a comprehensive manner. . .
Fonterra chief executive Theo Spierings’ job looks increasingly safe after the botulism contamination scare, with chairman John Wilson repeating the board’s support for the Dutchman’s handling of the incident. In a letter to Fonterra’s 10,500 farmer-shareholders Wilson said he wanted to “reiterate” the board’s confidence in Spierings’ handling of the scare and the actions that have followed. Wilson said he expected the board’s inquiry into the scare to be finished in six weeks. The scare sparked panic in Asian and China consumer markets, and big recalls of baby formula made by one of Fonterra’s biggest customers, Danone. . . Farmers were quick to express sympathy for Gary Romano, who resigned last week as head of Fonterra processing after the botulism scare that happened on his watch. Romano apparently felt responsible and resigned before results are known from four inquiries into the Hautapu plant dirty pipe and its aftermath. “I presume he didn’t feel comfortable, felt his time was up and left on his own terms,” Federated Farmers dairy chairman Willy Leferink said. “He was well liked and farmers will be very sorry to see him go.” . . . This is what Liz has to say …………………. I have recently had the pleasure of visiting 4 schools involved in the Archibull Prize for the Art4Agriculture program and I can honestly say that they all have been a different learning experience. In the past week I can honestly say that I have spoken to children in kindergarten in Sydney who believe that all farmers have animals to children in cotton growing regions who weren’t quite sure what a cotton plant was. . . In the space of a few days farmers went from the heights of Mt Everest to the bottom of the Marianna Trench. That is what it seemed lurching from the fantastic payout forecast into Fonterra’s product recall. We now know that a product, worth a few hundred thousand dollars, will likely end up costing Fonterra tens of millions. That is what CEO Theo Spierings told TVNZ’s Q+A on Sunday and will likely be customer claims relating to the recall. Fonterra’s recall was a shock and we absolutely must do the right thing by our customers and consumers. That is not in question. But if you were a consumer abroad and went off the New Zealand media coverage, you would have thought that Fonterra was some corporate version of Sweeney Todd. In my years of farming, I have come to learn that things are never as good or as bad as they first seem, they are just what they are. I do not think that Fonterra has done everything right but there’s a huge ‘damned if you do, dammed if you don’t’ reality when facing some feral media. Especially when the most feral are those in our own backyard. As the days went on the initial fever pitch whipped up was slowly replaced with a growing sense of perspective; testing had led to a precautionary recall. . . .
. . . Last Thursday there was celebration that the 2013/14 forecast payout would clear overdrafts built up over the drought. Then came news Clostridium botulinum had been found in the whey protein concentrate, WPC80. I sense we may just be getting through the worst of this initial crisis. Yet one unsanitary pipe at Fonterra’s Hautapu factory must not be allowed to define 120-year’s worth of hard work. . . .
Fonterra Cooperative Group’s tainted food scare has claimed its first scalp with the resignation of NZ Milk Products managing director Gary Romano. Romano, who initially fronted for Fonterra to New Zealand media while chief executive Theo Spierings went to China, has resigned effective immediately, the dairy company said in a statement. Spierings will personally assume interim responsibility for the daily operations of NZ Milk, which collects milk from New Zealand farmers and manufacturers it into dairy products ready for export. Romano’s focus was “to drive profitability through a customer-centric approach to business that delivers world-class standards in productivity, quality, safety and service,” Fonterra said on its website . . .
A commercial fisherman in Napier has taken the unusual step of speaking out about wasteful practices in the industry. Rick Burch says he’s sick of needlessly killing juvenile fish, and has developed a type of net he thinks can help. Mr Burch is the first to admit that he’s seen a lot of waste since first taking to the water in the 1960s. But he says making just small alterations to the standard pattern of a fishing net would save fuel and help release young round fish like gurnard. . .
Data released today by the Real Estate Institute of NZ (“REINZ”) shows there were 82 more farm sales (+23.0%) for the three months ended July 2013 than for the three months ended July 2012. Overall, there were 438 farm sales in the three months to end of July 2013, compared to 474 farm sales for the three months ended June 2013 (-7.6%). 1,536 farms were sold in the year to July 2013, 6.7% more than were sold in the year to July 2012. The median price per hectare for all farms sold in the three months to July 2013 was $20,667; a 15.1% increase on the $17,955 recorded for three months ended July 2012. The median price per hectare rose 4.8% compared to June. . .
Kiwifruit, fresh and furry, this vibrant wee fruit is irrevocably Kiwi, to the core. And now, partnered with its best-ever comrade – The Collective’s signature gourmet yoghurt, the ever-vibrant kiwi begs the question; who needs wings when you’ve got ridiculously tasty New Zealand dairy? Never being ones to disappoint we can tell you that the first taste of The Collective’s Kiwi will have your taste-buds tingling for more… a huge dash of national pride and a pairing of delicious dairy and kiwifruit, this gourmet treat might as well be called New Zealand in a tub… no bull! . . .
Fonterra has issued a food safety alert after tests indicated the potential presence of a strain of Clostridium (Clostridium Botulinum) in a sample, which can cause botulism. Given the potential seriousness of this an immediate recall of the small amount of products which could be affected would be sensible. That trust is built on a reputation for high standards, and a swift and open response to any food safety issues.